Lynn Fecteau is a Coconut Grove artist whose work just seems to get better as she moves along. She has been painting beautiful pictures for as long as she can remember. She can’t remember when she never did artwork or didn’t think of herself as an artist. Even as a little child, she remembers doing it. She grew up in Cherry Hill, NJ, where her family would spend the summers on the Jersey Shore. The family had a boat. Those early days had a profound influence on her. 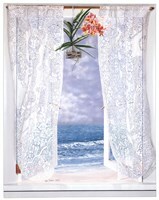 Lynn has developed a love for the ocean and had her working area having a good view of the ocean. She has always been fascinated by the ocean. She loved to go to the end of the jetty and sit there or sit on the beach looking out at the ocean. So, it makes sense that she’s painting oceans now. The ocean has become her trademark theme. Lynn had her first show at the Riviera Country Club and that was the first window she ever painted. She says it was pretty crude because she didn’t know much about perspective back then. However, it sold and everybody loved it. So she decided to try it again, and it worked. She thinks people just like the idea of looking at a blank wall and seeing a painting of something calm and serene. Her art is in many collections, including: Sheraton, Bel Harbor, FL; Groupo Ecologista Del Mayab, Mexico; Metro Bank, Coral Gables, FL; Soprano Productions; Arvida, Weston, FL; Doral Coutry Club., Miami, FL; Sandals Resort, St. Lucia; Muscular Distrophy Association; WLRN Public Radio, Miami, FL; and National Anti-Vivisection Society, among others.